The sleeveless top is completely lined and closes with velcro. (snaps or buttons could be used). The shorts are pull on! I have made these many, many times and takes me about 30 minutes to make both the top and shorts. I think even a slow sewer could sew these up in one or two hours. 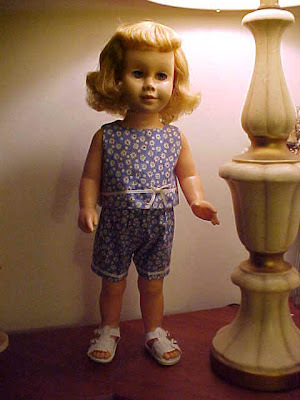 If you sew little summer outfits for your child, this pattern is wonderful since you can use the scraps and have an outfit for her favorite doll! This is also the perfect little top to machine embroidery. If you have lots of samples from "practicing" then this is the pattern for you! Just center the design on the pattern, cut out lining and you have a really nice top for your favorite doll. The shorts are elastic waist and very simple to make. The little sleeveless top is completely lined and Velcro in the back. This is a super easy pattern to make and doesn't take more than an hour to make both pieces. Use up all your scraps and make some little child happy with a nice summer wardrobe! The top pattern is great for all those little trims and ribbons that you have saved for a small project. 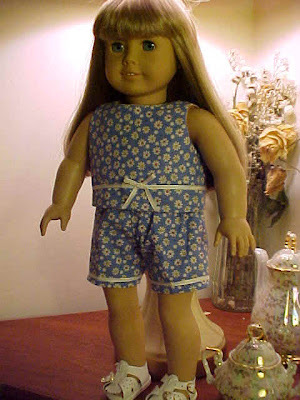 This is also a great pattern to make as a matching doll and child pattern since the top and shorts pattern can easily be made up in the same materials. I have made these up in Fourth of July fabrics, Easter, and just all sorts of cute conversational prints! E-Pattern emailed with $5.00 payment by paypal. E-Pattern also is available with How To Video showing how to sew up this pattern. Both are downloadable for $10.00 by paypal.